This edition of Who Pooped in the Park? follows Michael and Emily on a trip through the Black Hills of South Dakota. 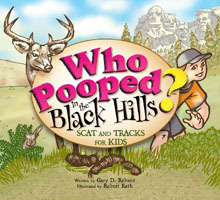 This book will expose children to the wildlife of the area, and to the amazing scenery of Black Hills National Forest, Wind Cave National Park, Mount Rushmore, Custer State Park, and the Crazy Horse Memorial.